Dividend Challengers are stocks with a history of consecutive rising dividends of more than 5 years but less than 10 years. If you believe this is a criterion only fulfilled by a few companies, you are right. There are only 113 stocks with such a dividend growth history. Dividend growth is very important for your retirement funds. If you buy several of the best dividend growth shares, you could double your passive income from dividend in ten years easily. Over twenty years, your dividends should quadruple. Smart investors like you are always looking for simple stock trade ideas of highly recommended stocks. I like to combine both criteria. 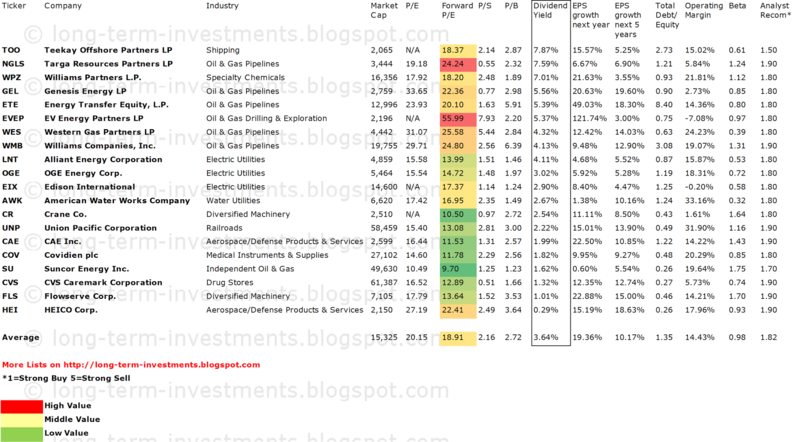 I screened all Dividend Challengers by the best rating notes from brokerage firms. In order to eliminate the risks of lower capitalized stocks, the market capitalization should be over $2 billion. Teekay Offshore Partners (NYSE:TOO) has a market capitalization of $1.83 billion. The company employs 1,590 people, generates revenue of $949.06 million and has a net income of $-96.87 million. The firm’s earnings before interest, taxes, depreciation and amortization (EBITDA) amounts to $288.40 million. The EBITDA margin is 30.39 percent (the operating margin is 10.61 percent and the net profit margin -10.21 percent). Financial Analysis: The total debt represents 64.52 percent of the company’s assets and the total debt in relation to the equity amounts to 456.88 percent. Due to the financial situation, a return on equity of -22.40 percent was realized. Twelve trailing months earnings per share reached a value of $0.00. Last fiscal year, the company paid $1.98 in the form of dividends to shareholders. TOO has a strong buy rating. Market Valuation: Here are the price ratios of the company: The P/E ratio is 21,229.51, the P/S ratio is 2.16 and the P/B ratio is finally 4.24. The dividend yield amounts to 7.97 percent and the beta ratio has a value of 0.61. Suncor Energy (NYSE:SU) has a market capitalization of $49.63 billion. The company employs 13,026 people, generates revenue of $40.404 billion and has a net income of $4.370 billion. The firm’s earnings before interest, taxes, depreciation and amortization (EBITDA) amounts to $11.509 billion. The EBITDA margin is 28.49 percent (the operating margin is 17.77 percent and the net profit margin 10.82 percent). Financial Analysis: The total debt represents 14.41 percent of the company’s assets and the total debt in relation to the equity amounts to 27.92 percent. Due to the financial situation, a return on equity of 11.67 percent was realized. Twelve trailing months earnings per share reached a value of $3.10. Last fiscal year, the company paid $0.44 in the form of dividends to shareholders. SU has a current buy rating. Market Valuation: Here are the price ratios of the company: The P/E ratio is 10.47, the P/S ratio is 1.22 and the P/B ratio is finally 1.28. 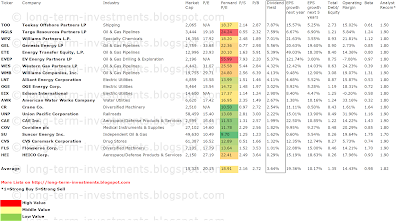 The dividend yield amounts to 1.63 percent and the beta ratio has a value of 1.74. Covidien (NYSE:COV) has a market capitalization of $27.10 billion. The company employs 43,400 people, generates revenue of $11.852 billion and has a net income of $1.902 billion. The firm’s earnings before interest, taxes, depreciation and amortization (EBITDA) amounts to $3.044 billion. The EBITDA margin is 25.68 percent (the operating margin is 20.34 percent and the net profit margin 16.05 percent). Financial Analysis: The total debt represents 22.64 percent of the company’s assets and the total debt in relation to the equity amounts to 47.70 percent. Due to the financial situation, a return on equity of 18.66 percent was realized. Twelve trailing months earnings per share reached a value of $3.92. Last fiscal year, the company paid $0.94 in the form of dividends to shareholders. COV has a buy rating. Market Valuation: Here are the price ratios of the company: The P/E ratio is 14.61, the P/S ratio is 2.31 and the P/B ratio is finally 2.58. The dividend yield amounts to 1.80 percent and the beta ratio has a value of 0.85. Take a closer look at the full list of the most recommended Dividend Challengers. The average P/E ratio amounts to 20.15 and forward P/E ratio is 18.91. The dividend yield has a value of 3.64 percent. Price to book ratio is 2.72 and price to sales ratio 2.16. The operating margin amounts to 14.43 percent. The average stock has a debt to equity ratio of 0.98. If you like this list, please give us a Facebook Like! Or post a comment on Twitter! Investing in companies that regularly raise dividends provides security in an uncertain market and means higher returns ahead. When looking to build a long-term portfolio of stocks that pay high dividends, investors usually come up with a mix of stocks that either have high dividend yields or high dividend growth rates. It is difficult to find good companies that have both. This means that there is often a choice to be made. All else equal, should one invest in the company that has that enticing high dividend yield, but a low dividend growth rate, or does one exude patience and invest in the company with a relatively low yield, but a high dividend growth rate? If you look closely at past performance you will notice that most dividend stock move up just before the dividend ex-date. Why not just buy before the ex-date, take the profit equal or greater than the upcoming dividend. Sell for profit and move on to the next dividend stock. It is a little twist on the dividend capture strategy.... but a little more profitable.